Steve Ballmer, the chief executive of Microsoft, vowing that the company’s $6 billion plunge into the ad business two months ago was not just an experiment, said today that advertising would become 25 percent of the company’s business within a few years. 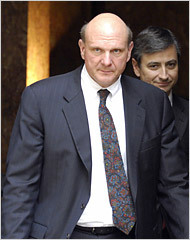 Mr. Ballmer’s remarks came the same day that the British online advertising trade group, the Internet Advertising Bureau, reported that Internet marketing had grown 41.3 percent in the first half of 2007 and now accounted for 14.7 percent of the British ad market. The total British market grew 3.1 percent during the first half of the year, to £9.1 billion ($18.2 billion). Without Internet advertising, however, total media spending would have fallen by 1.9 percent. “Once again the Internet has propped up the U.K. advertising economy and remains the fastest-growing advertising medium,” the group said.